This week’s material is, Steel. Steel is one of the most important materials of current day existence. Every where one looks, there are products made with steel of all different alloys in every facet of life. From the machines we operate, to the buildings we work in, to the cooking utensils we eat with, some form of steel is present. While we cannot cover all aspects and alloys of steel, we’ll focus on the general processing of steel, the difference between plates, bars, and coils of steel, and the 4140 alloy. All raw materials (coke, iron ore, and lime) are first combined in a blast furnace that melts all of the ingredients into a liquid iron substance. These blast furnaces can reach up to 2,300 degree Fahrenheit. The liquid iron is then sent either to an Electric Arc Furnace, or a Basic Oxygen Steelmaking process. Both processes mix scrap metal into the liquid iron to lower the amount of carbon to 0-1.5% of the material. This is the first major step of producing steel, as the liquid iron is typically 4-4.5% total body weight of carbon, which is too brittle of a substance to machine. Secondary processes and additions are made to improve or add elements to the mixture in order to produce desired alloys. Once all ingredients have been added, the mixture is cast into billets, blooms, ignots, or slabs. The resulting billets, blooms, ignots, and slabs are then formed into the product that is sold to manufacturers. These products include, sheet metal, bar stalk, and coiled metal. Three of the main forms that steel processors create, that we mostly work with, are sheet metal, bar stalk, and coils. Sheet metal is self explanatory in its form, it’s simply rectangular or square sheets of metal. Depending on the gauge and dimensions of the sheet metal, they can be quite heavy. Sheet metal is either hot or cold rolled from slabs of raw material. Sheet metal is great for laser cutting projects, or any sort of paneling or automotive applications. Steel coils are used in stamping operations, especially when high speed production is desired. 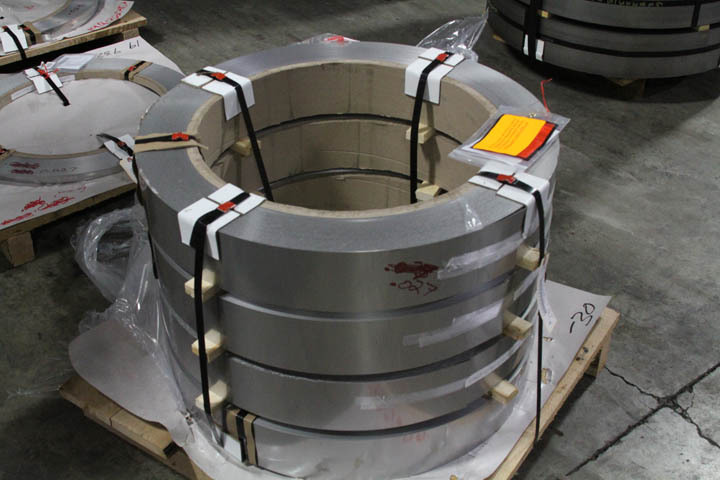 Steel coils allow for the manufacturer to load the coil on a reel or un-coiler. The running speed varies based on the feeder, and die speed. Bar stalk comes in a wide variety of dimensions. Some bar stalk is closer to a cube shape, where all three dimensions are equal or close to equal, where as some bar stalk is alomst small sections of sheet metal. 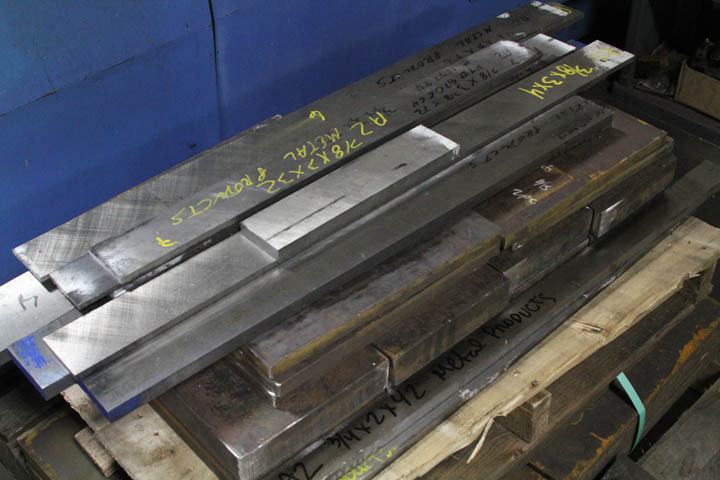 The dimensions of bar stalk required depend on what the final part’s dimensions will be, as limiting scrap metal is key to any machine shop operation. Bar stalk is usually derived from billets as they tend to posses the flexibility for thickness bar stalk requires. Steel bar stalk is best used for machining projects. The 4140 steel alloy is commonly used in machining situations. There are nine classifications of steel alloys. The beginning numbers are determined by the amounts of alternative elements within that steel. These steel grades are given by the AISI and SAE, and are consistent through out the US, and the world. 4140 steel alloy falls within the Molybdenum steel grade, and possess .12 to .3% Molybdenum, .5 to .95% Chromium, and the remaining percentage Iron. 4140 steel is great for machining die components, as it’s easily machinable as annealed material, but can be hardened in multiple ways. A pile of 4140 steel bar stock used for machining purposes. If this hasn’t quenched your thirst for steel processing and manufacturing, a great step-by-step explanation can be found at the World Steel Association’s, “Steel University” website. This entry was posted in Materials on January 8, 2014 by johnatmetalproducts. I can only imagine that heat that is emitted through steel processing. I wonder how hot the furnaces have to reach before any of the materials start to melt. It was pretty intriguing to read about that process. I’d always wondered how companies worked with materials like steel. It is hard to imagine the kind of heat those furnaces put out. Makes you really appreciate all of the steel workers around the world that provide us the materials we need to build infrastructure, buildings, cars, and so many different things we use every day.